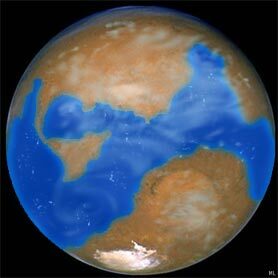 Mars after humans alter atmosphere. The Great Prophet Nostradumbass predicts that 200 years from now humans will have settled on Mars & the Moon. The atmosphere in each case will be altered to suit humans and cities and towns will be established on the Moon & Mars. People born on Mars and the Moon will not be earthlings they will be Martians and Moonies.